This scholarship fund was established in 2009 in honor of special needs students whose challenge is Down syndrome or Autism. Ben Milne, who the scholarship is named for, participated in the Snohomish High School graduation in 2009. During this graduation exercise, Ben got up and left part way through… his response whenever it got too noisy. 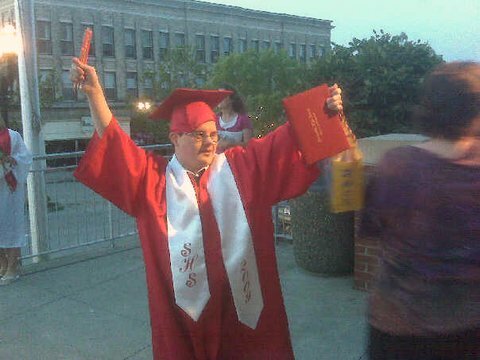 Later his step-mother got him back in line on the steps leading up to where Beth Porter, the principal, shook hands with each graduate and gave them their graduation certificate holder. Ben took the opportunity to give everyone on the stage, beginning with Beth, a big hug, before finding his way off the back of the stage. There was Ben, wearing the smallest sized cap available, which was still too large, with a handful of pencils while showing his excitement at having ‘graduated.’ He didn’t, of course, and continued attending school until his 21st birthday as provided by law. The scholarships are intended for applicants dedicated to obtaining a degree in special education or related fielding including art, music, dance, physical therapy, sign language, speech therapy, language or communication technology, integrative architecture, community planning or similar disciplines at a Washington state four-year college. It is intended for applicants dedicated to improving the level of education, lifestyle, and community involvement of people with Special Needs. A scholarship is awarded at GPHS and SHS.